Buying foreclosed property at a sheriff’s sale is one way to get a great deal on an investment property. There are several rules for this type of sale and understanding them can help you make an educated – and perhaps lucrative – purchase. A sheriff's sale is a type of public auction where interested buyers can bid on foreclosed properties. In a sheriff's sale, the initial owner of a property is unable to make their mortgage payments and legal possession of the property is regained by the lender. The lender will then attempt to sell it to recover some, if not all, of the outstanding mortgage balance. Sheriff's sales take place locally and are usually conducted at the county level. Sheriff’s sales occur quite frequently. You can check with your county’s sheriff department to determine how often they take place near you, but it's usually at least once a month if not every week. What Types of Properties Are Auctioned Off? All the properties being auctioned off are foreclosures, and there are numerous types of properties up for grabs. You might find single family homes, multi-family homes, mixed-use properties, larger complexes, and even commercial buildings available for purchase. Where Does a Sheriff's Sale Take Place? Sales typically take place in the sheriff’s office or at the county courthouse. In some areas of the country, they're actually conducted on the front steps of the courthouse rather than inside. A sheriff's sale is open to the public. Lenders sometimes attend or send a representative in an effort to bid to try to buy back their own property. This move by the lender is permitted. One thing to note: everyone must have certified funds available before they can bid on a property. 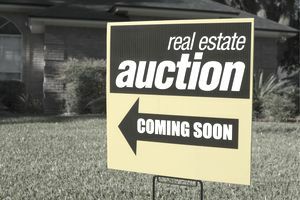 You can go to a couple of places to view a list of the properties that will be auctioned off at the next sheriff's sale. Many sheriff's offices have websites where you can view the upcoming sales online. You can also get a list of the properties to be auctioned off by physically going to your local sheriff’s office. Properties available for purchase are also usually advertised in the local newspaper as much as a month before the actual sale date. Your local sheriff’s office can tell you which publications will carry the notice. Each property will usually include a docket number, a sheriff's department number, or a court case number. It will name the plaintiff in the foreclosure action and the defendant. It will include the property address and a description of the property, as well as the "upset price." The upset price is the minimum amount that the plaintiff (typically the lender) will accept for the property. The property won't be sold if bids don't meet this amount. The upset price might be lower or higher than the actual judgment amount, the amount of money the lender is entitled to recover to cover its losses. The plaintiff’s attorney or another representative will often bid on the property to try to drive the price up. In order to be prepared for the sale, you may want to do a full coverage title search in advance on all properties you think you might be interested in if you plan to bid. Some areas allow you to conduct this search online while others require that you conduct the search at the main courthouse. You can also hire an attorney to take care of this for you. You'll want to find out if there are any liens against the property at either the state or federal level. This can include tax liens placed by the Internal Revenue Service or local taxes or even water charges. It can be a judgment lien placed by another of the homeowner's creditors. You might be responsible for paying any of these liens that were not wiped out during the foreclosure court proceedings. Contact the town or municipality where the property is located to find out if there are any open permits on the property. You'll have to spend money to close them out if you purchase it. How Much Money Do You Have to Bring? This will differ depending on the amount of money you're willing to spend on a property as well as the amount of down payment that's required. The amount you must put down can vary by location so check in advance. Some towns require 10 percent while others require 20 percent. The funds must be in cash, certified check, or money order. Personal checks are rarely if ever accepted. If a sheriff's sale requires a 10 percent down payment on successful bids and the most you're willing to pay for a property is $180,000, you must bring proof of funds of $18,000 to the auction, or 10 percent of the ultimate purchase price. When Do You Have to Close on the Property? Again, this will depend on the rules set for each individual sheriff's sale, but you must usually close within 30 days of successfully bidding on the property and submitting your down payment. Some sheriff's sales require that you close on the property sooner than 30 days and others have a longer closing period. Many sheriff's sales will publish these rules online, or you can call or go to the sheriff’s office for a full list of requirements.